From about 1881 Richard Parsons, listed in the census as a dairyman, was resident at the house that is now 185 Middle Street. Kelly’s Directory for 1902/3 records Herbert Sewell, dairyman. Sewell ran Court Lodge Dairy at both 10 Broad Street, south-west of the junction with Middle Street (now The Sugar Boy old-fashioned sweet shop) and 185 Middle Street (with Mrs C Peake). 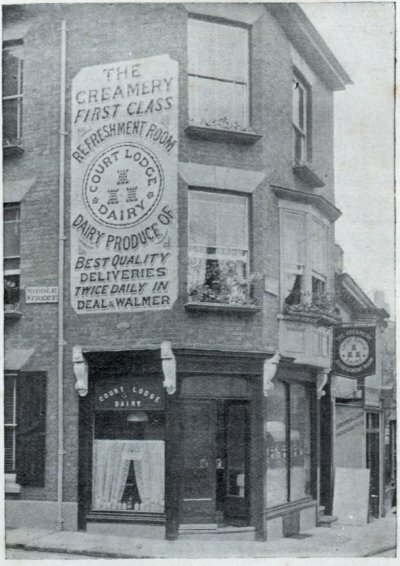 When Charles Page ran Court Lodge Farm, the dairy also had an outlet in Margate. Details of the dairy operation were published around 1897 in an illustrated book promoting several local businesses. COURT LODGE FARM DAIRY, East Kent Depot for the Preparation of Humanized and Sterilized Milk; also for the Supply of New Milk, Cream, Butter, etc, etc, Court Lodge, Middle Deal. Branch Depots: 10 Broad Street, Deal ; 7 and 9 Duke Street, Margate. Proprietor: Mr. CHAS. H. PAGE. …The sterilization of new milk, as now carried out under Mr. Page's direction at Court Lodge Dairy, is (in England) a comparatively recent invention, but of its extreme value from a hygienic point of view there cannot, we think, be any division of opinion. The milk prepared by this process contains intact all its nutritive properties, being merely subjected, by means of a special treatment, to a heat sufficient to absolutely destroy all germs(which besides being inimical to health also have a tendency to create sourness), without, however, in any way deteriorating its flavour, altering its appearance, or rendering it less palatable. For feeding infants, for invalids' use, or even for every-day household purposes. Milk so treated is in every way superior to the ordinary supply, while the cost is so slightly enhanced as to be barely perceptible when the entire absence of waste is taken into consideration by the consumer. The contents of a bottle will remain perfectly sweet for three or four days after opening; for it only 'begins its life' when opened, and is in the same condition as to freshness as when taken from the cow. Sterilized milk is, we think, a distinct factor in the reduction of infant mortality, and its use cannot be too strongly recommended to mothers or those having charge of young children; whilst for general purposes, especially during the prevalence of any epidemic, it is an absolute safeguard against the dissemination of dangerous disease germs. 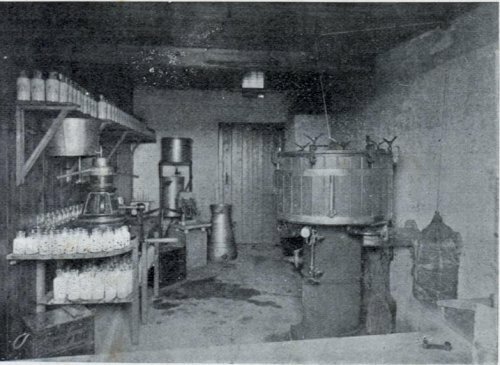 Humanized milk (under the process of Professor Gustav Gaertner) is also prepared at Court Lodge Dairy, Mr. Page being the concessionaire for the districts of East Kent and Maidstone. This is also an invaluable preparation in relation to the health of infants…[it]…contains only milk sugar, and is so prepared as to imitate exactly the food provided by Nature, containing, in fact, only about one half the casein (curd) and a still smaller proportion of mineral salt than is to be found in cows' milk; whilst it is rich in fat-forming material (cream), and readily flakes into an easily digestible condition in the child's stomach, instead of thickening into a hard and indigestible mass…It is most carefully manufactured at Court Lodge, under the strictest hygienic and sanitary conditions, from the milk of selected cows, and is on sale either at the depots, at 10 Broad Street, Deal, and 7 and 9 Duke Street, Margate, or can be delivered in any part of East Kent to order. Mr. Page, whose family have been extensively interested in dairy-farming in Deal and Walmer for many years, keeps a large number of fine cows, the cleanliness and general health of the herd being the subject of special and constant attention. A veterinary surgeon makes a periodical inspection, and the animals are both well fed and warmly and comfortably housed. In addition to the specialities above mentioned, Mr. Page supplies, direct from his (arms, rich new milk and cream, fine fresh butter, new-laid eggs, etc, to families and visitors residing in any part of the 'sister towns'. Research: Ian Williams. Additional material kindly provided by Sue Carey and Steve Glover.